Hello, and welcome to our final article on Retrieving the Venus 1500 Version 4 Database. So far we have talked about transferring your database, retrieving your content and your database. Today we will talk about sharing your database. We are often asked about sharing databases and/or content among multiple computers, and I think the following 2 questions sum this up the best. Q: Can I publish to the display from two or more computers? A: Venus 1500 v4 was designed to work on a single stand-alone computer. This database is not designed to be shared on a server network or with multiple computers. In fact, whichever computer was last used to publish your schedule will overwrite anything that was previously published to your display. Q: Can the Venus 1500 v4 database be shared among multiple computers? A: Yes. There are 4 different ways that you can achieve this, and we will break them all down for you in this article. If you need multiple users to access the dedicated Venus 1500 computer, then you may use a VNC or remote program to gain access to the Venus 1500 computer from another computer. Examples of remote programs include: Ultra VNC, PC Anywhere, and VNC Viewer. However, Daktronics does not support any third party program or the setup of any VNC/Remote program. Save your content externally in Content Studio for reasons such as adding to an email as an attachment or saving to a shared drive. By doing this, people in different locations are able to review presentations and provide feedback before anything is saved or published to the display. This also allows multiple people to create content within Content Studio and then send it to the primary computer being used to schedule. Just remember, each computer running Venus 1500 v4 will need to be licensed. 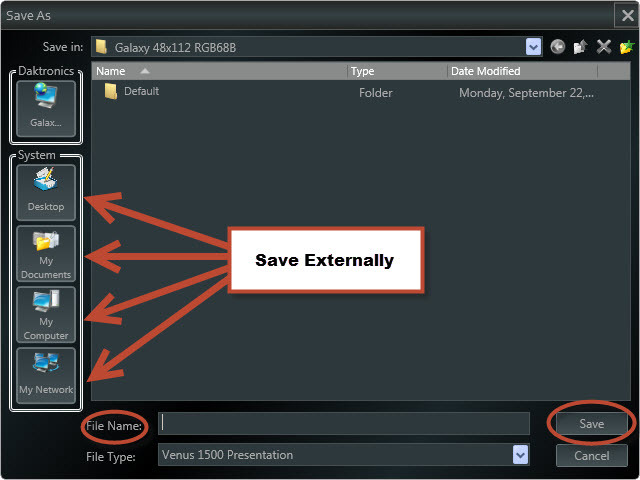 Also, remember that in order to view the content you will have to open it within Content Studio, and it must be saved in the Venus software to be able to schedule.Here is how we save our content externally. Click on the Content Studio Application Menu and choose SAVE AS to save a presentation to another location. Double-click on the folder you want to save in, give your presentation a name, and click on the SAVE button. Copy your database from one computer to another in case one has crashed or you upgraded to a new computer as we discussed in our first article in this series. Using this method will not synch up the databases though, it will just provide you with a backup copy. Retrieve messages from your display to another computer by following the steps outlined in our second article in this series. Remember this will only give you the content that is currently running on the display. Thank you so much for taking the time to read this week’s article. We hope it (and the complete database series for that matter!) will prove useful for you! Be sure to check back next week for a new article, and if you haven’t already, take some time to look through our previous blog posts full of helpful and fun ideas! Thanks again! Can Venus 1500 v4 database be shared between multiple or more than one computers? How to save a presentation in Content Studio on one computer and email or transfer to another computer?